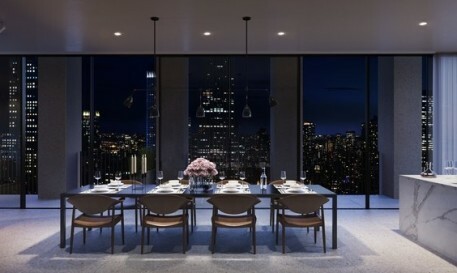 The Bryant is the first ever residential condominium built on Bryant Park and the first ground-up residential tower in the United States designed by internationally celebrated architect David Chipperfield. As the final residential tower site on Bryant Park, this new landmark is a rare opportunity to live on one of the city’s most celebrated and carefully restored green spaces. Situated in the heart of the city and at the center of it all, The Bryant is one of the most exciting urban residential architectural accomplishments in recent history. The Bryant’s central location and lofty vantage point offer stellar views of the world’s most famous skyline. The comprehensive amenity suite at The Bryant is one of purposeful simplicity, offering residents beautiful spaces to arrive, relax, and entertain. A marvelously clad marble lobby offers a serene 24-hour attended entrance to the residences while an adjacent lobby lounge provides a convenient respite. For entertainment, the sixth floor holds the Club Living Room Lounge, a soaring double-height space with fireplace, conference and dining rooms, full bar, and adjacent terrace overlooking Bryant Park. Situated atop a boutique hotel, residents of The Bryant will enjoy an impeccable suite of services. These a la carte conveniences include housekeeping, dry-cleaning/laundry, in-residence dining and catering, porter service, and priority access to the hotel’s restaurant. Furniture brand Radnor is taking over a two-bedroom Midtown condo at The Bryant and giving it a full makeover as part of New York Design Month. This pop-up in the David Chipperfield Architects-designed building on Bryant Park coincides with the launch of the Radnor Made collection. 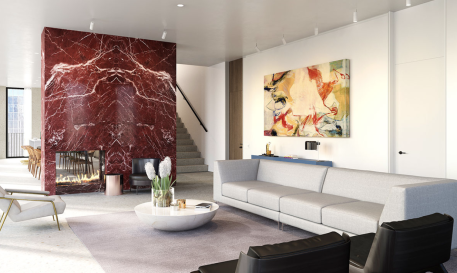 The furniture and artwork that Radnor brings in will feature the same natural materials and warm tones as the residence itself, highlight some of the two-bedroom home’s subtle accents like the herringbone wood flooring and honed terrazzo borders. Best of all, the installation is completely functional, giving visitors a sense of what the home might look like with a particularly tasteful resident. A beautiful Red Jasper fireplace forms the centerpiece of the new David Chipperfield-designed penthouse at The Bryant. The fireplace, which spans two levels, makes a powerful statement by standing in stark relief to the rest of this Midtown condo’s subtle interiors, which features an open layout where the kitchen and living room are elegantly divided by the feature fireplace. The penthouse spans 5,400 square feet, including the double-height loggia and private rooftop terrace that offers residents magnificent southern views of the city skyline and Empire State Building. 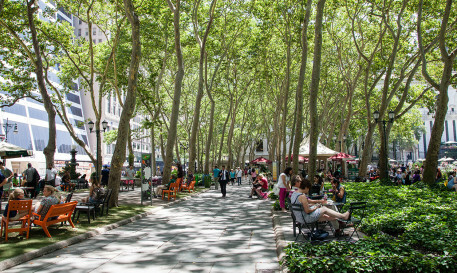 On November 8th, The New York Times delved into Bryant Park's appeal in today's real estate market, illuminating its attractive and varied architectural palette, green spaces, fabulous culinary scene, and incredibly convenient location. The neighborhood is increasingly attractive to buyers who seek a classic Manhattan residential experience with the convenience of a Midtown location. As new residents flock to Bryant Park, construction is continuing apace at The Bryant, the new luxury condo tower from HFZ Capital. These terrazzo-clad Midtown condos are designed by David Chipperfield Architects, a firm known worldwide for its precise, modern style. The resulting residences at The Bryant feature high ceilings and corner windows that shed ample natural light on details like the herringbone oak flooring and custom millwork. When complete, The Bryant will be home to 57 luxury homes whose residents will have access to the building’s amenities as well as the bevy of restaurants and cultural attractions that make Bryant Park one of Manhattan’s most exciting neighborhoods. There could be no better architect to design the only new development on Manhattan’s famous Bryant Park than David Chipperfield. The award-winning Englishman has crafted a 33-story Midtown condo building that is both modern and traditional, in honor of the historic space it occupies: with views of Bryant Park and the Empire State Building, The Bryant employs terrazzo columns and concrete elements to connect with its urban surroundings. The building’s crowning jewels are its triplex penthouses; their setback façades flow into outdoor areas that, in turn, seem to flow into the breathtaking Manhattan skyline. 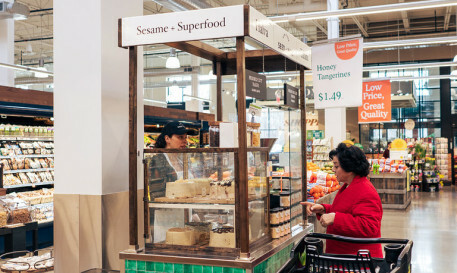 By including carts and stands featuring food by local chefs, the newly opened Whole Foods Market near Bryant Park brings a touch of the artisanal to the cultural hotbed. Like New York itself, the foods on offer here come from around the globe: Detroit-style square pizza will slide out of a stone oven beside perfectly sliced sushi and alongside big-name vendors like Loi Estiatorio and Seed & Mill. With the addition of this high-end grocery store to the neighborhood, the Bryant Park condos for sale at The Bryant truly have everything anyone could need within easy walking distance of Fifth Avenue. Luxury tower The Bryant has recently topped out at 34 stories and will welcome its first residents later this year. The building soon will be home to 57 NYC condos for sale — the first to be built on Bryant Park — starting on the 16th floor, with a boutique hotel below. Inside each home, residents can enjoy floor-to-ceiling sliding windows, oak herringbone-patterned floors with radiant heating and terrazzo edging, kitchen counters and backsplashes hewn from Calacatta gold marble, Elkay stainless sinks, Gaggenau appliances, bespoke white lacquer millwork for storage, Dornbracht fixtures, Statuarietto walls and counters, rainfall showers, and Juliet balconies overlooking Bryant Park. The building’s pair of triplex penthouses will feature private elevators, fireplaces, 400-square-foot loggias, and private rooftop decks. In addition to a menu of a la carte hotel services, residents can also enjoy amenities like the doorman-attended lobby, porter service, fitness center, club lounge, private lobby lounge, dining room, conference room, private storage, and a terrace. David Chipperfield Architects and HFZ Capital Group are working together to develop a new luxury building overlooking Bryant Park. Dubbed “The Bryant,” the terrazzo-clad tower will house 57 Midtown condos, as well as a hotel that will occupy the lower floors. 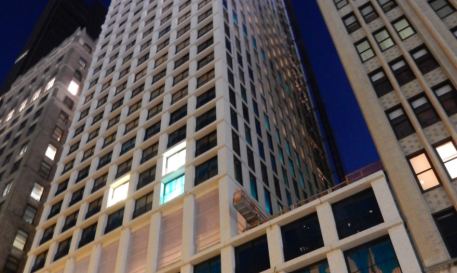 The HFZ Capital Group-developed luxury tower The Bryant recently topped out at 34 stories from its Bryant Park-adjacent perch. 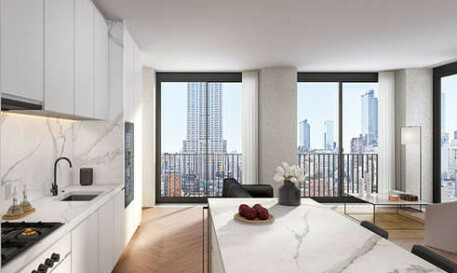 Starting on the building’s 16th floor, the David Chipperfield Architects-designed tower will house 57 Midtown condos, ranging in size from one to four bedrooms, in addition to triplex penthouses. A boutique hotel will occupy the building’s lower floors. 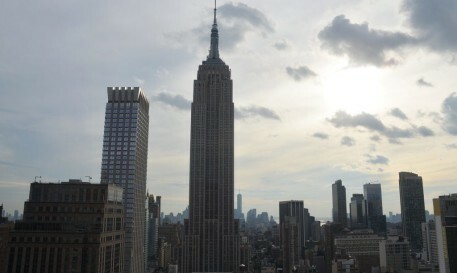 Amenities include a sixth-floor lounge designed by Stonehill & Taylor, a ground floor restaurant, and views of New York icons like the MetLife building, Empire State Building, One World Trade, and the Statue of Liberty. Edging ever closer to completion, architect David Chipperfield’s Midtown condos for sale at The Bryant have recently reached their full height of 34 stories. The luxury tower, which marks Chipperfield’s first residential building in New York, sits on Bryant Park’s southeast corner and will house 57 luxury homes and a boutique hotel. 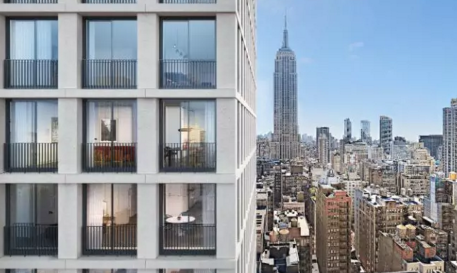 HFZ Capital Group has teamed up with RIBA Stirling Prize-winning architect David Chipperfield to create The Bryant, a residential tower taking shape over Bryant Park. The 57 luxury Midtown condos should be complete by the end of the year, with finishing touches currently underway on the building’s exterior. In addition to one of the city’s most enviable addresses, residents can enjoy a wide variety of amenities, including a terrace with views of the park, a private lounge, and access to hotel services. David Chipperfield is the man behind the Midtown condos for sale at The Bryant. The luxury tower, which is the British architect’s first residential project in New York, will feature 57 luxury condos overlooking Bryant Park. 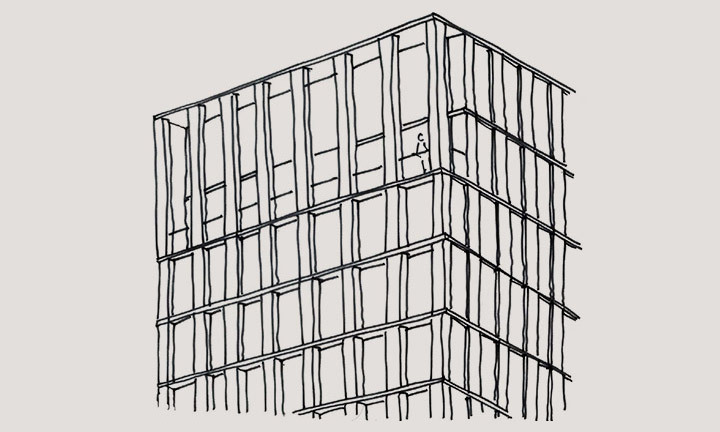 David Chipperfield Architects was founded in 1985 and now maintains offices in London, Berlin, Milan and Shanghai. The practice boasts a broad portfolio embracing retail, hospitality and residential projects, and is acclaimed for its cultural and institutional projects. Notable buildings include the Neues Museum in Germany, The Des Moines Public Library in the USA, the Museo Jumex in Mexico, the Hepworth Wakefield in the UK and the Nobel Center in Stockholm, Sweden. David Chipperfield Architects has won over 100 international awards and citations, including the Royal Institute of British Architects (RIBA), Royal Fine Art Commission (RFAC) and American Institute of Architects (AIA) awards. The Bryant is David Chipperfield Architects’ first ground-up residential project in New York City. HFZ Capital Group is a Manhattan-based real estate investment and development firm focused on luxury residential condominiums. It currently manages or develops over four million square feet of premium Manhattan real estate and boasts expertise in a broad range of real estate disciplines, including underwriting, analytics, structured finance, investment, development, construction and asset management. HFZ has a stellar record of preserving and restoring historic buildings to impeccable standards. 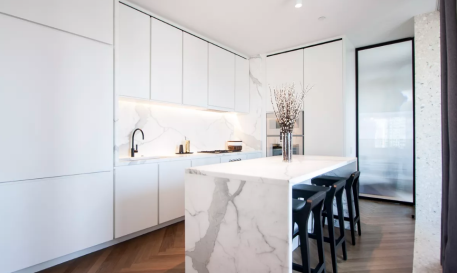 It is one of the most prolific developers of luxury residential condominiums in Manhattan, and collaborates with world-renowned architects and designers to undertake architecturally significant ground-up new developments executed with the same degree of taste and thoughtfulness. Stonehill Taylor is a New York City-based architecture and interior design firm established in 1986, the successor firm to Lundquist and Stonehill, founded in 1963. Their portfolio embraces a wide range of luxury hospitality projects, including premium marques like the Crosby Street Hotel, St. Regis New York, NoMad hotel and bar, the Ace Hotel and the Refinery Hotel. Stonehill Taylor has an international team bringing expertise in new building construction, addition, renovation and interior design. Focused on delivering unique, innovative solutions for every project, the firm emphasizes clients’ needs rather than a signature look. It prides itself on strong client relationships and enjoys many repeat assignments and on-going consultancies as a result. Founded in 2005, Corcoran Sunshine Marketing Group is the product of a merger between The Sunshine Group and Corcoran Group Marketing. Individually these two firms had redefined the landscape of New York City residential marketing since the mid 1980s and their union brought together the best and brightest minds in the business. Now Corcoran Sunshine is a full-service marketing and sales firm that can draw upon over 25 years of experience and a network that is second to none. Corcoran Sunshine is the recognized industry leader in the planning, design, marketing, and sale of luxury residential development. With properties throughout the United States and in select international locations, Corcoran Sunshine Marketing Group’s portfolio contains a curated collection of the world’s most desirable new addresses.